One week into his comeback tour, Phil Collins, 66, has cancelled two upcoming sold-out shows after suffering a fall in his hotel room. Following a performance at the Royal Albert Hall in London on Wednesday, the singer apparently slipped on his way to the bathroom and hit his head on a nearby chair, leaving him with a “severe gash” on his face. He was later transported to a nearby hospital where he is “recovering well,” but was being kept under observation for 24 hours. A post was shared on the singer’s official Facebook page Thursday. “Phil sends his sincere apologies and thanks to fans,” the post read. 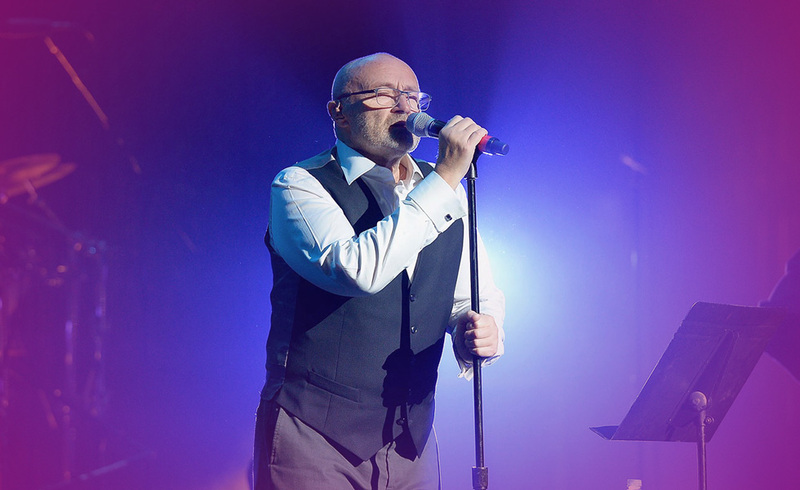 “He has had a fantastic week at his first show in 10 years, cannot thank people enough for their warm reaction and is excited to return.” We unfortunately have to announce that Phil Collins’ performances at the Royal Albert Hall in London will be postponed tonight (June 8) and tomorrow (June 9). Phil suffers from ‘drop foot’ as a result of a back operation which makes it difficult to walk. He rose in the middle of the night to go to the toilet and slipped in his hotel room, hitting his head in the fall on a chair. He was taken to hospital where he had stitches for a severe gash on his head close to his eye and is recovering well. He will be kept under observation for 24 hours. Phil sends his sincere apologies and thanks to fans. He has had a fantastic week at his first shows in 10 years, cannot thank people enough for their warm reaction and is excited to return. These Royal Albert Hall shows will be rearranged for November 26th and 27th this year. All tickets for June 8th will be valid for November 26th and tickets for June 9th will be valid for November 27th. He will carry on with this tour on Sunday in Cologne and then Paris before returning to London for his headline performance at BST Hyde Park on June 30th. I believe that Collins has a lot more physical difficulties than he is revealing but he wants and needs to get back to performing, so he will carry on. He has been doing this a long time, so he is scheduling performances to not push he health issues. Just bad luck Phil and hope no more incidences will keep the audience from hearing your wonderful talent on stage again. This card is stalemate, not knowing what decision to make. I believe Collins thought long and hard about doing live performances again and if his body would hold up to the stress but obviously decided to go for it. This card is overcoming fears and moving forward. Since the card was drawn inverted, I feel he might be having some doubts about his decision of going back on tour after this accident. This card is a woman who lives well, very loving and mothering. He has not been very successful in his marriages in the past but I believe he has a woman in his life now that is being very supportive for him, which he needs.